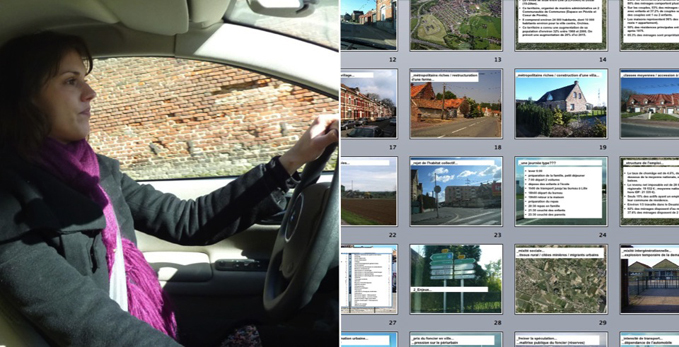 Posted by admin on July 17, 2010; This entry is filed under Design Role Analysis, France, Investigating, Nord-Pas-de-Calais, Periurban Area, Pévèle, Pévèle > Periurban area > Nord-Pas-de-Calais > France. Logistical constrains with the organisation of the first exploratory workshop at the design school Les Ateliers ENSCI in Paris did not allow a real in-depth field investigation of the Pévèle area in general and of the fabric of social innovations available. Instead, the D2PE department of the Regional Council delegates the staff who is currently managing a Foresight approach on the future of the periurban area conducted by an external consultancy. D2PE develops a macro-understanding the critical challenges of periurban areas in the Nord-Pas-de-Calais region but pointed a local development agency, the Syndicat Mixte du SCoT du Grand Douaisis for more information on the local dynamic of the Pévèle. As a preparation step for the exploratory workshop, a sort of ‘photo safari’ in the Pévèle area was organised to quickly get an overview of the key-topics for the future of the Pévèle area and generate the related iconographic support. Concretely, both staff from the D2PE and the local development agency were embarked in a car for a half day visit of the Pévèle area. This investigation setting allow to trigger a rich exchange between their respective macro and micro point of view, capturing photographic evidences directly from the car. The safari allows to quickly generate a synthetic and illustrated overview to brief the group of students participating to the exploratory workshop.